B.A.T. BOMBSIGHTS - Let's fix'em all! DOF, TGA and WAW Bombers were taken to the hangar for B.A.T. v3.6 THE BLITZ. Some fixes worked better than others but absolutely all bombers have now working bombsights and usable bombardier stations (where applicable). Fixes were applied directly to the B.A.T. core and files cannot be provided separately because of the sheer amount of code changes between B.A.T. 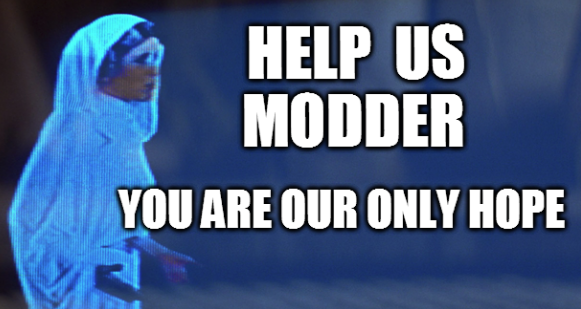 v3.6 THE BLITZ and standalone mods and because of non-documented interdependencies with other mods. This project is complete but there always is room for improvement. Some bombers will be revisited and improved in the future and you can use this topic to report bombardier-related issues. 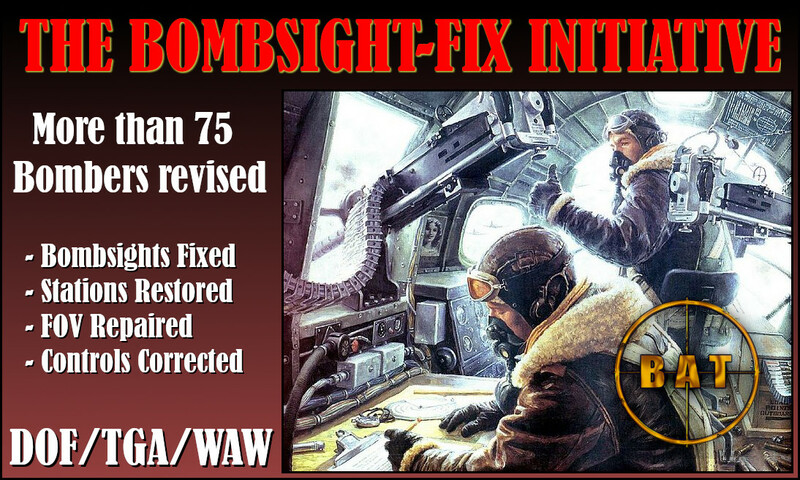 4.12 broke many old mods and bombsight fixes have been surfacing slowly but steadily. For one reason or another some fixes went unnoticed to the B.A.T. crew. A bomber with a broken bombsight is pretty much useless and we won't see these heavies featuring in any missions. So much potential wasted! I just got started with this so I ask a little patience. Many aircraft must be yet reviewed. I intend to maintain this post and update it often but I have little time. Interesting case here, the Z.1007bis works again when reinstating the original classes from the AI Flyables but the fix breaks even more the Z.1007 Early & Z.1007 Cargo... what should be done? Thanks in advance for your collaboration!! Re: B.A.T. BOMBSIGHTS - Let's fix'em all! Review the first post for the all-in-one patch download. Cheers Henky, accepted as 'the researcher' let's however thank the modders that took the time to re-code the bombsights for 4.12. I cannot fix broken sights myself, I tried and failed, but will keep trying. as we say in French a bomber without a bombsight is like " a beautiful girl with a missing tooth"" une jolie fille à qui il manque une dent"
In Ju 388K, Ju 88A-4 Late and Ju 88A-5 the position of the bomber can be used, but the bombsight does not appear with the corresponding key, at least in my B.A.T. V3.5 Musketeer. The Ju 388K is easy to fix loading the original cockpit mod, but for the other two I have not found any solution. Surely someone with more knowledge can fix it. Many thanks for the report sturmbock. I confirm the Junkers 388K Bombsight gets fixed by applying western's update. Good catch! Thanks western! Unfortunately the Ju 88A-4 Late and Ju 88A-5 remain unfixed. 4 New fixes by Stefan SG that will be part of the next B.A.T. Expansion! Project complete. First post updated. You can use this topic to report bombardier-related issues or create a new topic in the tech section.